A mesmerizing debut novel about love, grief, and the ghosts who show up where we least expect them. Sarah McConnell's husband had been dead for three months when she saw him in the grocery store. What does a woman do when she's thirty-nine, childless, and completely alone for the first time in her life? Does it mean she's crazy to think she sees her late husband beside a display of pumpkins? Or is it just what people do, a natural response to grief that will fade in time? That's what Sarah McConnell's friends told her, that it was natural, would last a season, and then fade away. But what if there was another answer? What if he was really there? They never found the body, after all. What if he is still here somehow, and about to walk back into her life? Laura Brodie is a Harvard graduate and visiting professor of English at Washington and Lee University in Virginia. Her first book, Breaking Out: VMI and the Coming of Women, was published by Pantheon to critical acclaim. Her memoir, One Good Year: Love in a Time of Homeschooling, is forthcoming from Harper. 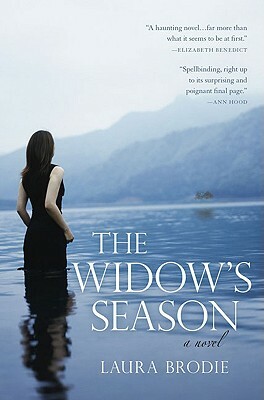 The Widow’s Season, her first novel, won the 2005 Faulkner Society/Evans Harrington Grant for Best Novel-in-Progress. Laura lives with her husband and their three daughters in Lexington, Virginia. "In The Widow's Season, Brodie draws on literary traditions, but hides the academic stuff under the flow of smart dialogue and sharp detail. This is a work of craft and imagination." "In The Widow's Season, Laura Brodie confronts all the twists and turns of grief and loss, love and marriage, and the human heart with honesty, humor, and great intelligence. This novel is spellbinding, right up to its surprising and poignant final page." "The Widow's Season is far more than what it seems to be at first - a straightforward story of a woman getting used to a crushing loss. It's smarter, slyer, and more unconventional than that. It's haunting-and haunted too." What are some of the meanings behind the novel's title? Why do you think the author chose it, and how does the plot follow the holiday seasons? At one point Sarah wonders "What could be extraordinary in the life of a woman like her?" Why does she think her life is so mundane, and what is ironic about her question? Sarah feels angry and frustrated about many of the things in her life—the downfall of her marriage, her inability to carry a child to term, David's disappearance. How does she finally find peace with herself? This novel stemmed from the author's graduate dissertation on widows in English literature-in particular, a chapter where "dead" husbands, (either ghosts or men who fake their deaths), watch their wives. Take a look at the novel's epigraph, which comes from that study. Do you think that today's widows still feel that their husbands are watching them? Does society encourage them to keep their husbands present in their lives? What are some of the underlying reasons that Sarah and Nate have the affair? What do they gain from the relationship? Why do you think Margaret encourages it? Sarah is mourning more than just the loss of David when he disappears. Explore why she is in such a dark place in her life. Can she pinpoint when it happened and why? After learning that David survives the storm on the river, and hearing his explanations for his actions, do you think his "hiding out" was a selfish act or a reasonable option? Why do you believe the author tells the story both from Sarah's and David's points of view? Sarah thinks to herself, "Age...does not appear first in wrinkles or gray hair, but in the dulling of one's smile." How does this sum up the life she was living with David before his disappearance? Why do you think David is so real to Sarah? Why does she need him to be? At the end of the novel, we discover what really happened to David. Did Sarah create an alternate reality, or is David a real ghost? What did she expect to gain from her life with David? Was it for her peace of mind and healing, or to give him the chance to live the life he had always dreamed? What was needed both from David and Sarah in order for his ghost to finally leave?